Close to the start of our MBA, 13 of us had the opportunity to explore the career opportunities in Singapore on 28th and 29th July, 2016. The group met each other the day before, which was a great introduction to the rest of the trek, as we exchanged backgrounds and interests, as well as which Colleges we got into! The company visits started at Mapletree, a Singaporean real estate development and investment company. For me, the highlight of this visit was the showcase of assets owned across the world by the company and the unique Mapletree Executive Program (MEP). For anyone interested in asset management or investment roles within the real estate industry, the MEP program needs to be on your radar. Next was Millward Brown Vermeer, a marketing consultancy firm which operates under the WPP plc umbrella. We realised by then, that with every company we were going to visit, three things were certain: food, warm smiles and the readiness of company representatives to answer our questions. We left Vermeer with great insights on the processes involved in delivering quality branding strategies. With our bellies full of pizza thanks to Vermeer, we headed on to our next destination, Microsoft. At Microsoft, we learned more about Microsoft’s Academy of College Hires (MACH) MBA program. The program provides MBA graduates with exposure within sales, marketing, finance and operational functions, building an overall strong understanding of Microsoft’s business and strategy. The availability of development programs for MBA graduates is definitely a plus point to anyone looking to develop holistic general management skills. Our day did not end at Microsoft; Cambridge MBA alumni treated us to a night of dinner, drinks and fruitful discussions. We learnt that MBA students only had time to do two out of three things: socialise, study, or sleep. What did the alumni do? Socialising and studying of course! As I relish my sleep, my natural follow up was, “So when did you sleep?” To that, they wittily responded, “We sleep now, and it is past our bedtime”. Meeting alumni definitely got us excited about the great time ahead of us, come September. The next day started with a visit to Ogilvy Mathers, where we met with the Advertising, Planning and Public Relations team. They shared with us some of the campaigns that they had created, the impact the campaigns had on the brands and how best to connect brands to the minds and hearts of consumers. Before meeting up with Google, we visited the food court. There, most of us experienced something new: every empty seat had a name card, tissue box or access card on it, signifying that the seat was taken, or what Singaporeans referred to as “chopped”. Nonetheless, we blended in, “chopped” our seats, and chowed down. Maybe there is space here for a mobile application, anyone interested in developing Chopped? After lunch, we went to the Google office, where two CJBS alumni greeted us. The presentation stared off with a quiz, followed by a tour of the Google premises, which was a maze of creative workstations, cafeterias at all corners, a cinema, massage chairs and a gym. 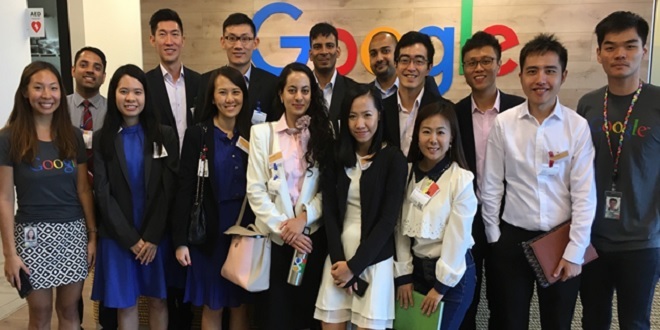 At the end of the tour, we understood why Google was the at the top of MBA employer rankings! Our final destination was at Maersk Management Consulting. 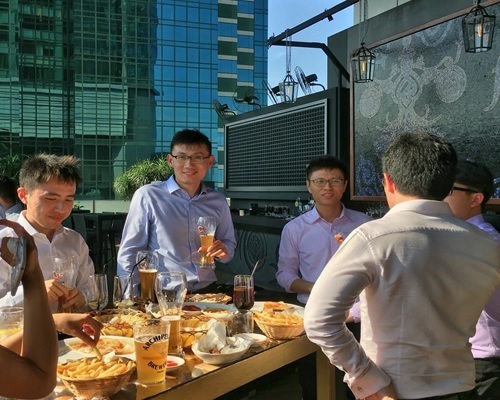 Here, we met the newly formed in-house consulting team based in Singapore. The presentation emphasised the difference between in-house consulting and consulting firms, providing us a fresh set of opportunities to explore. Overall, the trek gave us a great initial step in exploring our career options post MBA, having met a varied set of companies. The whole experience definitely opened our eyes to industries we might not have considered before, networks within the companies, and most importantly an understanding of where we might fit.